This is the contest where our artists who can draw can submit their designs and we will then do a poll to choose the best model. This will be opened for any submissions for the next 2 weeks. Then we shall do a poll in the third week and then begin production for the prototype model. - it can be 2 legs or 4 legs. - It is designed to wield melee weapons in at least 2 arms modules. Wrist weapons or weapons that replaces the hands are acceptable, it needs to have room for its shoulders to eventually hold 1 mana cannon when that weapon will be available. - it has to be fairly well armored since it will be fighting against other siege engines and enemy wargolems and against infantry. - Rule of cool trumps realism but it still needs to be simple enough for Reza to draw in a weekly manner and not absurd looking. -Most important aspect of this golem is it has to be a piloted golem. I will not accept any golem designs that does not have a seat for a pilot. Those AI types are dumb, stupid and unreliable in a fight since they still require a handler on the outside to give it orders. Because of the high enery cost of riding such a golem it needs to have 2 pilots. One for moving the golem and the secondary to control the weapons modules and to replace and power up power cores that will be depleting fast. We don't want the golem to turn into a coffin for the pilots because they are to weak to open the sealed hatches due to mana depletion. - Very important last rule, it needs to be able to be fitted with different weapons configuration since we can replace modular parts to change its weapons load-out depending on what we need to deal with. So you are allowed to design different arm weapons for your designs is highly encouraged. Last edited by minalia on Sun Apr 21, 2013 12:59 am, edited 1 time in total. minalia wrote: - It is designed to wield melee weapons in at least 2 arms modules. Wrist weapons or weapons that replaces the hands are acceptable, it needs to have room for its shoulders to eventually hold 1 mana cannon when that weapon will be available. does the cannon really have to be mounted on the shoulders or can we also place it somewhere else? Note: Last panel at the very bottom. But like I said before, we need to get our hands on big guns before that happens. Though we have yet to develop the technology to expel mana based projectiles, but Ash'arion is working on that, specifically mana cannons. If we can develop our own mana cannons, we can also modify the mechanism to expel mana projectiles in a spray like fashion. As for the flame part, we have fire foci and can easily produce more as long we got the gems to do it. So we need to get our hands on bigger gems to act as the catalyst for the flamethrowers. This is something I think we can achieve if Ash's projects bears fruit. Modular grape shot weapons could also come in handy for anti personnel purposes, for when fire just can't do the trick. Min, got a question here. Do you want that we post our designs and their explanations here, or make a separate topic for those to keep them clean and understandable? Everything in this thread i do not want to click on 3 different threads for each different models. I want everything shown, clearly explained (NO TECHNO BABBLE PLEASE!!!) and the reasons why we should pick your design above every other designs. Very well, here it goes. Multipurpose mobile war golem, working title "Manticore". A four-legged system with two arm units located in its mid-back, and a tail unit. Arm units work as a standard human/drow arm and use the base of golem limbs. "Shoulder" joint can rotate as well as tip down from straight-up by 150 degrees, while other joints act same as elbow and wrist joints. This kind of movement range allows the blades to both stab over golem's shoulders against bigger or heavier targets, as well as sweep by sideways in both short and long arcs against smaller infantry-sized targets. Tail unit's main function is to offer balance to the arms in their extended form, but can also be used as a weapon. Unlike front blades that have their inner curve sharpened (like praying mantis claws), tail's outer edge is sharpened instead. Tail's motions are quite same as arm units: it can turn sideways from its initial joint and extend from its other joints like arm units. This way, it can be used to eliminate both enemies on top and behind the golem if need rises. 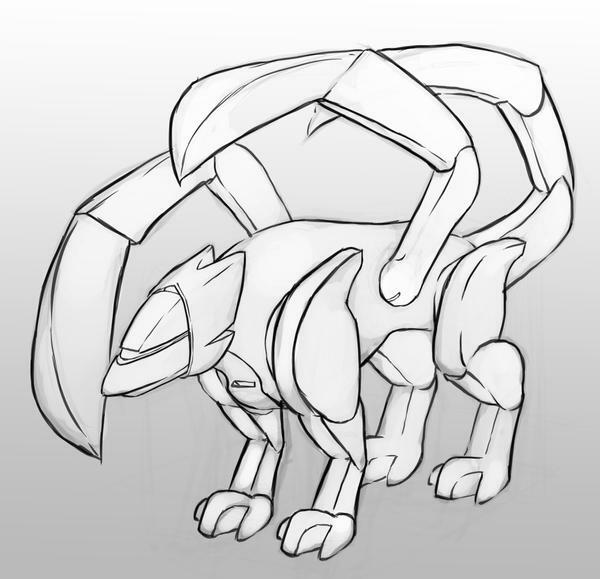 For storing, arm units can bend against and tail coil over the golem's back, while golem itself brings the whole body down into lying posture. Here, you can see the general size scale of the golem as well as positions of the pilots and the hatch. Main pilot lies on her stomach, using all their limbs to control the golem, while co-pilot sits in back-leaning position with added room to move around for changing the mana cores. Main pilot takes care of moving. Weapons are handled by co-pilot, though their limited control can be handed over to main pilot if situation truly demands so as well. 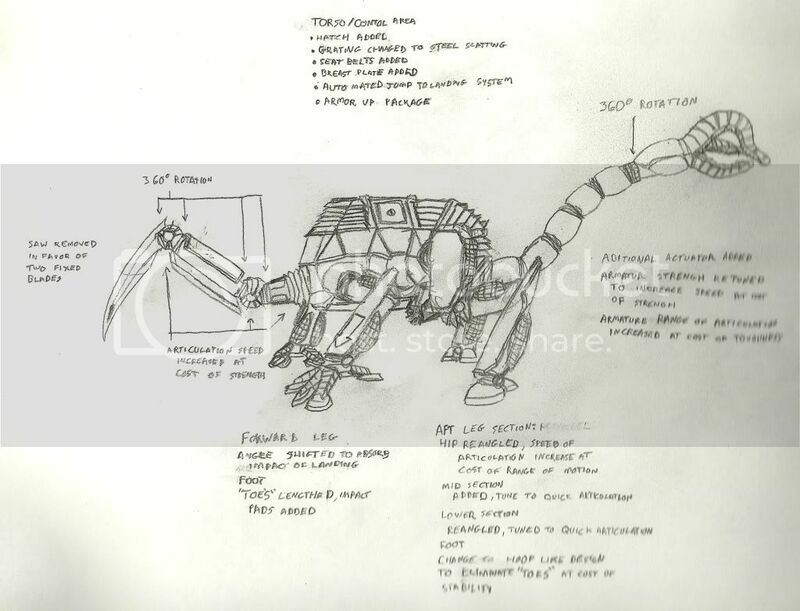 - Adding an underblade or horns to the head unit and fortifying it, allowing the golem to "ram" light targets. - Replacing frontal legs with heavier units that have built-in piston blades. Reduces mobility heavily, but allows using a tactic where golem tips large targets over and stomps them, using its whole weight as a base for the blades. - Adding larger shield units to the shoulder and hip joints. Again, this reduces mobility quite a lot, but allows the golem to withstand more small-hand fire and even possibly work as a mobile cover for infantry. - Replacing arm or tail unit's blades with other possible weapons, like hookblades, mace-heads, retractable chain flails and what else. As the golem's arms can work quite like any normal arm, most weapon types can work with them. Though, curved blades and scythe blades are most suited for this design. - Four legs equals better mobility. Also, the golem isn't done for even if it loses one of its limbs. - Arm units allow quite a lot of adaptability on the battlefield, as they can turn into mass-killing scythes or devastating single-hit stabbing spears in an instant. - Even if the golem loses two or more legs, it can use its arm units to still limp or crawl away. - Lower balance point means tipping the golem over is harder. Arms and tail units allow to counter any possible balance losses as well. - Lower position than similar-sized two-legged golem also allows for weapons to reach drow-sized targets more easily, without having to kneel down too much but at the same time keeping the golem large enough to pose a threat. - Psychological effect. Such outlook is rather common for carnivorous beasts, and seeing one on the battlefield like this can more easily frighten enemies, especially top-side races like halme. - With current distribution of moving and weapon handling, the main pilot can concentrate on moving in and out of the way while co-pilot lays waste to targets nearby. - Allows adding a larger mana cannon than normal two-legged model without sacrificing armor (four legs have higher weight capacity, and cannon can be placed in the middle instead of other side, thus no tipping to one side due to weight). All thanks for art to my good friend, Ronnie92, who sacrificed 20 minutes of her time to draw these artwork based on my very confusing explanations. A mana cannon might be too heavy for the head but a grape shot system shouldn't put it too off-balance, especially since you would want to fire before entering melee. Where do the pilots enter? I'm on my phone so I might have missed if you said where. Overall, I like it! Lot's of place for a feral to hang off of. 1. Sadly, I must remind you that we have no real method of creating a grape-shot weapons, as we lack gunpowder or even general idea of how to make it and mana weapons can just create giant blasts in the first place. 2. Pilots enter from hatch found between golem's shoulders. You can seen it from the size paragraph. Alternate link to it on my DA page In case the image is a tad to wide. Let me know if you think I need to add or clarify something. Else, enjoy! 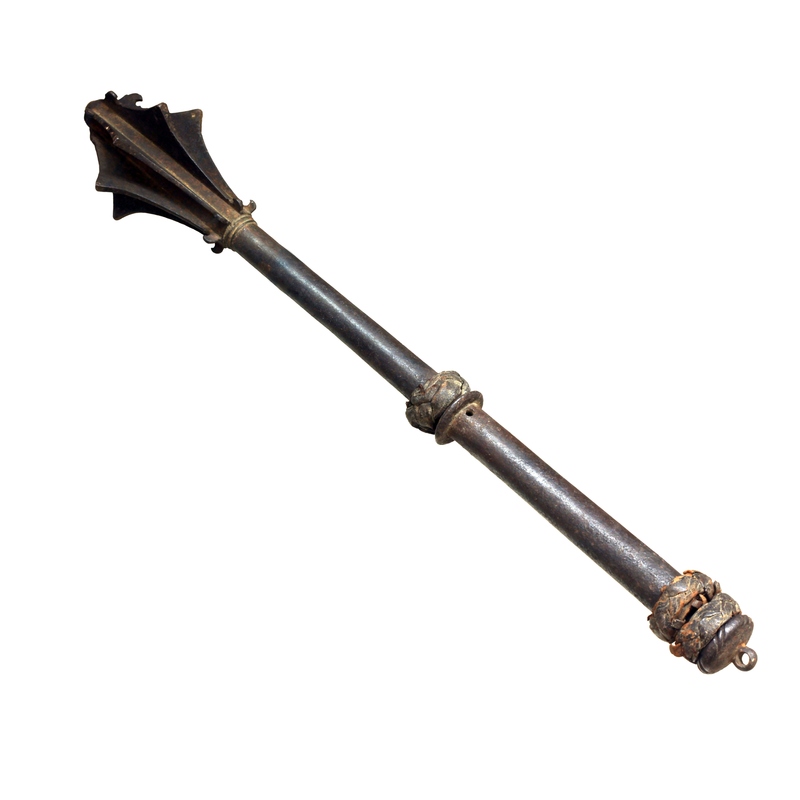 A versatile little thing that can be used for both melee and carrying heavy artillery. The mounting may yet have to moved a little further down the back and the head a bit higher for the golem to carry even larger artillery, but we're still in concept phase, anyway. On Kear's design, I don't really have that much to ask. I mean, it's a standard bipedal humanoid mech with adjustable equipment. What is there to ask? Only thing to mention that bit tips me off is its size. If the hatch allows pilots to walk in straight, this thing must be at least 10 meters tall based on the images, and it doesn't seem to be able to bend itself into less space-taking position. Storing such a thing onto airship is gonna be a bore... Naturally, this can be changed, but just felt it should be mentioned. On Finn's Tinkertoy, there are few things I feel like mentioning. One, the size of the legs and weight distribution. With this kind of body, this golem will tip over quite easily, as its balance point is high and legs don't cover that wide area when in two-legged mode. Also, they look like you could easily cut off one of its legs without any problems. Three, I still like the basic idea of this golem. Even if I still think it could tip forward quite easily when in four-legged mode if someone pushed it from behind. Please note that I don't want to disrespect your ideas, I want to shout out points I feel like we could still improve on them. A leaping melee design I made years back. Forward arm can swing left to right to down infantry or up and down like a pick for anti-golem/defenses work. Aft arm I did envision a tentacle articulators that could grasp on to people and thing and throw them at stuff, but could just as easily be replaced with a large morning star wrecking ball. The legs are a mix between frog forward and hourse-like aft. While walking this thing would probably be as awkward as a bulldog. But its primary attack mode is leaping into the enemy lines, crushing soldiers beneath, maiming and bashing them all around, then leaping again causing chaos everywhere. Eltharrion wrote: On Finn's Tinkertoy, there are few things I feel like mentioning. one: since Kear'Naun had to reuse parts of his own design (the hip joints among other things^^) in order to help me out on such short notice, the measures are not completely exact and therefore still subject to change. i'm thinking of a slimmer torso and the usual 4-leg-stance being more table-like. two: the golem isn't really meant to switch between 2- and 4-leg-mode without a 5 minute stop in the workshop - though standing up with just the feral basket or dropping on all fours while equipped with short, blunt weapons could surely be done. but definitely no cannon in 2-leg-mode and none of the more complex weapon hands in 4-leg-mode. laserkid wrote: But its primary attack mode is leaping into the enemy lines, crushing soldiers beneath, maiming and bashing them all around, then leaping again causing chaos everywhere. then i hope the interior is padded really well.